So, as previously noted in this post, I’m a huge Harry Potter fan. Seen all the movies, read all the books, and if I could ever remember my Pottermore password I’d be a huge nerd on that (alas, I cannot). So, when this was announced, I knew I had to get in on it. 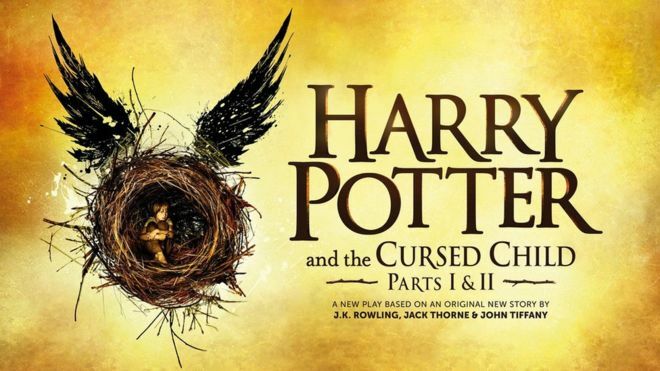 This is Harry Potter and the Cursed Child, the new play that is being cowritten by JK Rowling, which is being advertised as a continuation of the book series, following Harry’s son (the unfortunately named) Albus Severus (no but seriously, neither Harry or Ginny gave that one a second thought?) 19 years after the end of the series when he goes to Hogwarts. Rowling has said that it should be considered as much canon as the books are, so yeah, to a Harry Potter nerd of my caliber, this is basically irresistible. Of course, the problem that me and a few hundred thousand other fans then had to address was getting tickets. I’ve seen some people online upset because this is a play that is just being staged currently in London (though it will likely later go elsewhere and might have a DVD release) it severely limits the access of many fans, and that’s probably a fair point. However, given that it’s also true about all plays to start, and that if Rowling wants to make it a play that’s an entirely valid creative choice, I don’t see anything wrong with it. 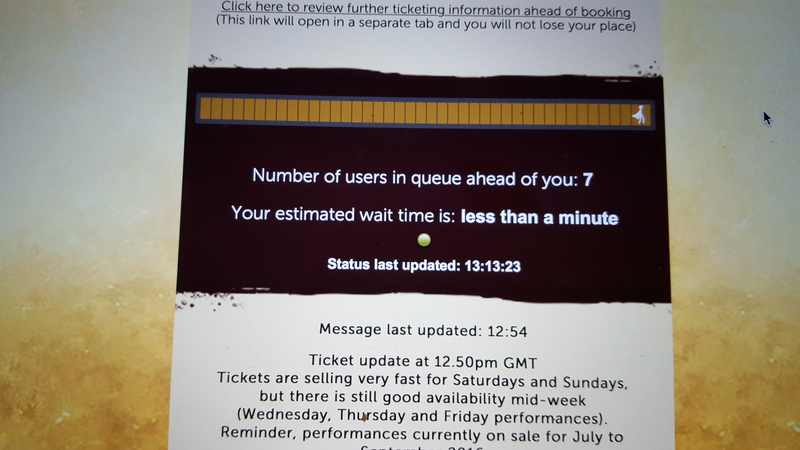 Add to that the fact that the bookings are really cheap – tickets range from 10 pounds to 65 (50 in the previews) a show (the play it should be mentioned is 2 shows, so you have to double that price) – but 100 pounds is about 230ish Canadian dollars, and you couldn’t buy seats in the nosebleed sections for that on Broadway. A roundtrip to London is definitely out of some people’s range, but I’m really lucky that it’s not out of mine – it’s actually less money to fly to London and then Berlin for me for my summer trip – so tickets were the only thing I needed. Supply and demand, however, was the real obstacle. The priority booking tickets went on sale this morning, and registering for priority booking stopped Oct. 24. 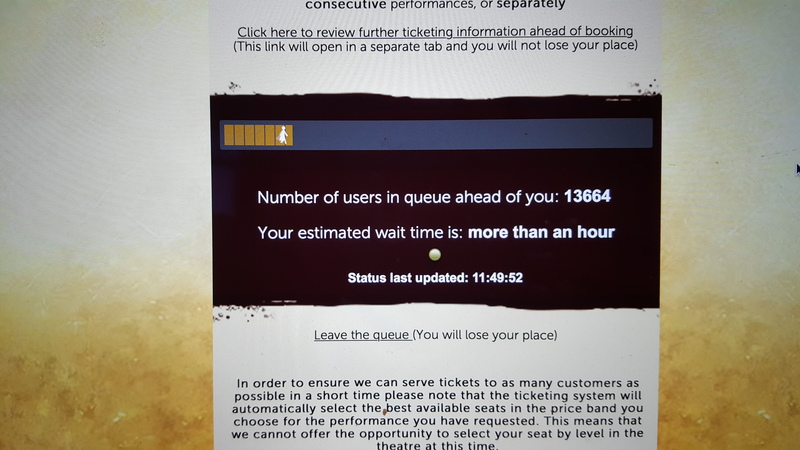 15 min before the booking opened (11am London time and 8:30 my time) and email was sent to everyone who had registered on the priority list to allow you to queue up (I love that particular Britishism); first a queue for the queue and then the actual one to buy tickets. 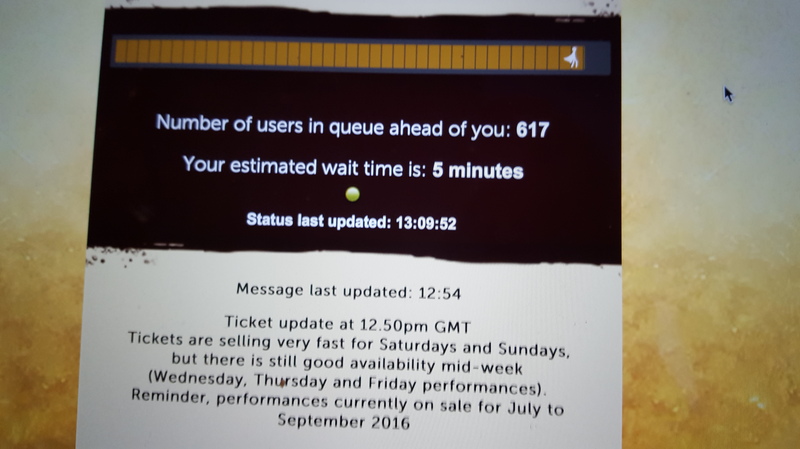 I informed us that everyone would be randomly assigned a place in the queue for tickets where you would be able to then buy up to six of them. So I waited for the clock to strike 8:30am, and then with a lovely little “bing” noise, I was redirected to the queue. 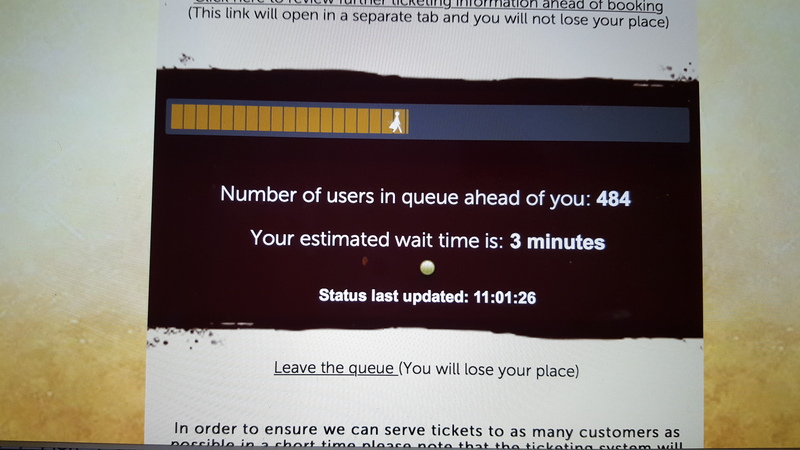 I was 800th in line, with a wait time of about 6 minutes, and I was ecstatic! 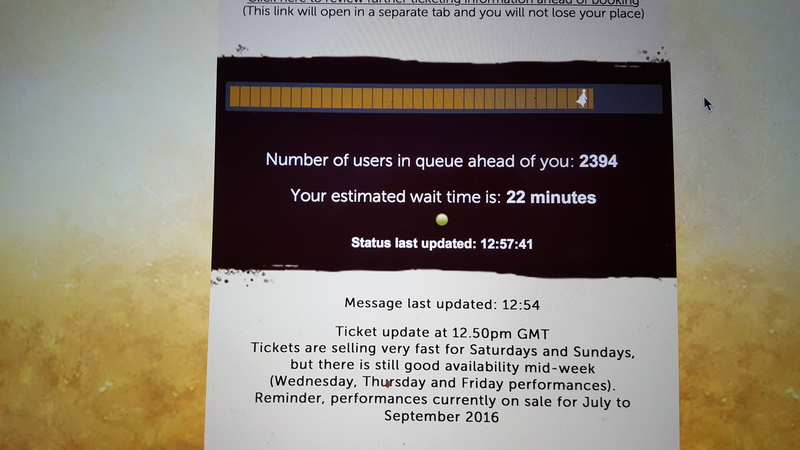 How’s that for luck I thought, and the queue thing updated every 30 seconds so it was easy to follow. And then once I got to 0 I was redirected to the site to actually buy the tickets. Now, a tiny snag was hit here, as the site was obviously slow to load, with some graphics taking forever, but I had expected that. No website is built to handle that kind of traffic, and I was still able to select the day I wanted, and the seats were auto-selected and I got A15 which was the first row and right in the middle so I was thrilled! And then, after adding my address, and my credit card info, tragedy struck. The “buy” button wasn’t registering as a button, and so I couldn’t click on it. Knowing that the purchase was timed, I tried to call the customer service number listed, and after several menus (and a long distance international call) I was told that because of high call volumes they weren’t talking any calls. And so, the session timed out and I lost the front row ticket. A dramatic reenactment of me at that moment. So, I clicked again to be added back into the queue. After some of the posts I’ve now read (people starting in the queue at 30 thousand, or having similar errors as I did and then getting back in around 60 thousand) I now realize I actually still had it pretty good, though in that moment, when I’d started at 800? Yeah, 17 thousand seemed impossible that I was going to get a ticket. But, I’d gone that far, and I refused to give up, so I stayed (and totally missed 2 classes, but apparently they were really bad lectures so bonus 😉 ) and watched this happen. But yeah no, watching that little guy/girl walk their way across that queue bar is totally Harry Potter purgatory 😉 However, I got in again, and the site was much smoother loading that time and although there were no sweet, sweet first row seats for the showing I wanted, there was a seat only nine rows back from the front still in the stalls – about a third of the way back, which is a great seat, by any theatre standard – so I headed back to the payment page with my heart in my throat. Would it be a disappointment twice? And yes, I know how privileged and lucky I am to be able to have the ability to fly to London to go see the show, and I’m incredibly grateful to be able to have such an opportunity. 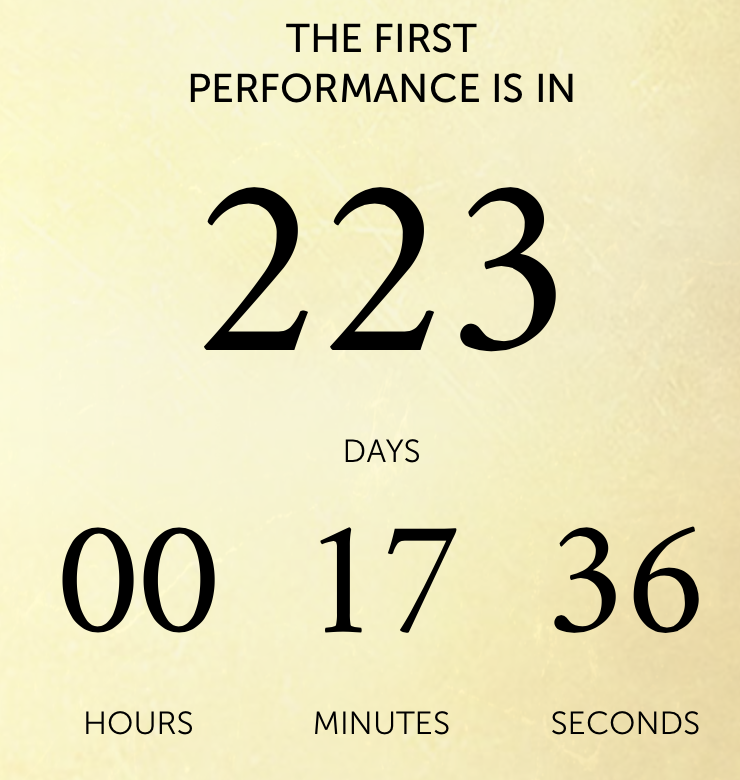 And for everyone who doesn’t have that ability, I very much hope a traveling production or DVD does come about – they already extended the run because the first booking period sold out before the general booking opens (the 30th) – so that all us Potterheads can have another opportunity to return to Hogwarts and believe in magic again. You don’t scare me countdown clock! I know, I was super lucky 🙂 And I hope they at least bring out a DVD recording or do a livestream of the play to theatres so everyone can see it! We won’t really be sure if we’re heading to the UK until mid next year (we’ll likely be going over my December break next year) so I’m pretty sure we won’t be able to get tickets with only six months notice which is kind of sad, but ah well. You will, of course, need to write a very detailed review! Well, you can buy them tomorrow for the Oct 2016-Jan 2017 booking period, and as of December there will be a refund system for tickets, so you could potentially get them tomorrow for your trip and then if you don’t go just get a full refund 🙂 Just food for thought! And yes, I will certainly review it after I’ve seen it! Wow! What a long wait! Good thing I didn’t have to subject myself to such stress, as I know I would never be able to fly to London to catch it anyway. Haha! A congratulations is in order! I felt like I was going through the emotional roller coaster with you! Haha glad you finally got seats but that’s so frustrating how close you were to front row ones!